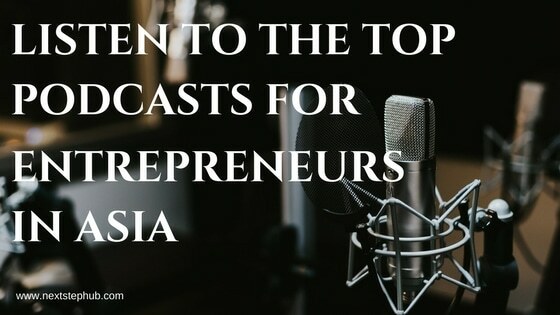 Podcasts are a great way to learn new entrepreneurship ideas and find out more about business opportunities, specially in Asia. Over the years, podcasting has become a popular way of consuming information. As of 2016, podcast listening grew to 23% compared to 2015. This increase in number has been driven by the growth of mobile devices and mobility. Smartphones, tablets, and apps enabled listeners to stream and download episodes which they can consume at their convenience. Unlike mainstream radio programs, podcasts cater to specific niches. This way, audiences can pick out the topics and discussions they want to follow and learn from. The topics discussed can range from humor, politics, opinions, and even how to’s and tips. Here are five of our top choices for the best business podcasts entrepreneurs in Asia should listen to. This podcast discusses, dissects and deeply dives into Asia’s advancements related to business, technology, and media. Founded by Bernard Leong, who serves as an angel investor within the Southeast Asia entrepreneurial ecosystem. Bernard has co-founded multiple media outlets like SGEio, an online media portal focusing on entrepreneurship in Singapore. He also co-founded Chalkboard, a location-based mobile ad network. He also taught and lectured about entrepreneurship and venture financing in Nanyang Technopreneurshop Centre & School of Physical & Applied Sciences. Important thought leaders from start-ups, investor and business ecosystems. Jay Kim is a Hong Kong-based investor and entrepreneur who actively supports the startup ecosystem in Asia. The Jay Kim Show features interviews with the world’s most brilliant minds in business, investing and entrepreneurship. The goal is to deliver actionable insights to the audience with every episode. Jay also founded Hack Your Fitness, the complete fitness and lifestyle solution for busy entrepreneurs and professionals. Check out his interview with Gary Vaynerchuk, founder of VaynerMedia. Made in China is a podcast created by Source Find Asia, who specializes in helping businesses achieve high performance in Asian markets. They provide their clients with research and insights into new markets, purchasing, and manufacturing solutions. They also provide assistance in product development and helps international brands enter the dynamic Asian markets. Made in China is focused on three topics: international business, crowdfunding, and entrepreneurship. Here they give you a peek of how it is to live and work in China through the eyes of the ex-pats they interview. Listen to crowdfunding success stories, bootstrapping tips, dating etiquette and even how to eat chicken feet in a convenience store. Marv de Leon is a solopreneur, graphic designer, web designer, author, columnist, business coach, motivational speaker and podcaster from the Philippines. After reading Tim Ferris’ book, ‘The Four Hour Workweek’ he was inspired to make the shift towards freelancing. He then decided to look for resources to help him start his freelancing career, but he found it to be lacking. So he decided to create his own. His goal is to help Filipino freelancers grow and thrive as a community. He wanted a space where freelancers can share their knowledge, expertise, and experiences. He hosts monthly meetups, events and workshops, newsletters, blog articles and other resources that freelancers get access to in order to better their craft. Check out this episode of Ask Marv, where he answers questions about freelancing. Mike Grogan is an International Speaker and Best-Selling Author who has worked in Europe, America, Africa and Asia. He believes that behavioral change is easy if you are using the right codes. Mike has been living in Manila since 2014 and is currently working for People Dynamics. Here he serves as a consultant and travels across the Philippines, helping inspire and motivate Pinoys to believe in the ‘Filipino Dream’. He is an international expert in Lean Management. Mike is also the first to bring lean management practices to health care in East Africa. He is also a Lean Six Sigma Certified Black Belt. Check out his interview with Ginger Arboleda, serial entrepreneur and mentor at Manila Workshops. Did we miss anything? Share your favorite podcast below!